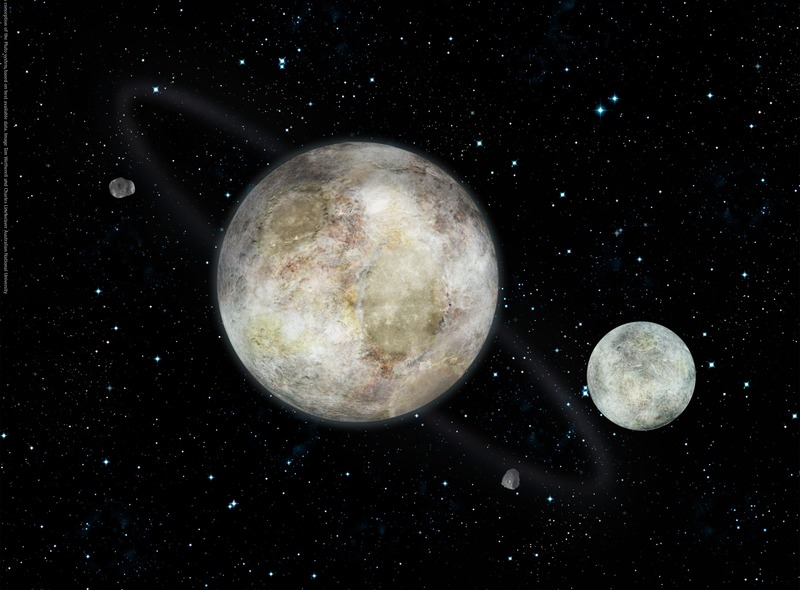 For roughly a month now, the SETI Institute (Search for Extra-Terrestrial Intelligence) has been holding an online poll – appropriately named Pluto Rocks! 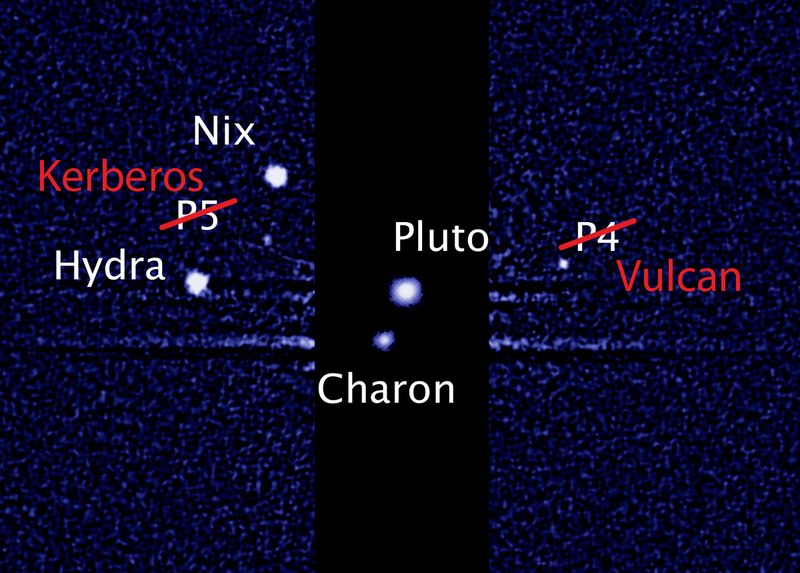 – to help them name Pluto’s smallest moons, officially designated P4 and P5. Discovered in 2011 and 2012 respectively, an online poll ran up until the end of February, at which point researcher and co-discoverer Mark Showalter took the names before the International Astronomical Union (IAU) to finalization. 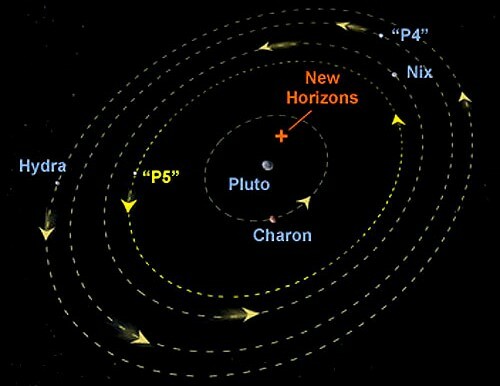 Although there were several choices for for Pluto’s fourth and fifth moon, it was P4 that became the focus of a great deal of attention. Of all the names for this space rock, two top contenders came out on top: Vulcan and Cerberus. Out of a whopping 450,324 people who took part in the poll overall, 174,062 voted for Vulcan, effectively putting it in the top spot. This was perhaps due to a little Twitter intervention by Mr. William Shatner. When the contest began back, it seemed that two camps emerged as the forerunners for naming the rock. On the one hand, there were the Trekkies who seemed determined to name P4 after famed-character Spock’s homeworld. On the other, there those who belong to IAU camp, who favored the classical Greek name of the beast that guarded the entrance to the underworld. After just a few days in, William Shatner, Mr. James T. Kirk himself, proposed the name Vulcan, and not just because of the connection to his show. In Roman mythology, Pluto (aka Hades in the Greek pantheon) was the God of the underworld and Vulcan was one of his sons. Cerberus might have been more appropriate since this beast was Pluto’s/Hades companion, but the connection still works, and provides a nice little tie-in to one of the most popular science fiction shows of all time. Fans and Trekkies worldwide rallied, and as of Feb. 25th, Vulcan had a comfortable lead over Cerberus and Styx, which were vying for the 2nd place position. SETI has now advised that people be patient, as it will take another months or two for the names of the two moons to be finalized and selected. However, barring any major objections or upheavals, I think it’s fair to say that P4 and P5 will henceforth be named Vulcan and Kerberos. And I have to say, this is fascinating news in more ways than just one. Not only does it demonstrate that our collective knowledge of the outer Solar System is growing. It also demonstrates how henceforth, astronomical studies and cataloging may become a much more democratic affair. Once considered the province of academics and scholars, space exploration may truly be an open field in the future, subject to mass participation. Oh, and congrats to Mr. Shatner for his enduring influence, to Mr. Nimoy for the shout-out, and to Trekkies the world over for showing what a committed fandom made up of millions of geeks can do! And may all the people who bullied you for your interests and keen intellectual skills consider what a force you’ve become and cower in fear! In Greek mythology, Vulcan is Hephastus, and he’s the son of Hera and Zeus. I wonder why he’s Pluto’s son in Roman mythology? Sounds like Asylum Studios, those guys who make crappy films like Red: Werewolf Hunters or MegaPython or Crocosaurus. They’ll do a knock-off, but they’ll make sure it’s unique enough that they can’t sued for it. Yep, heard of them. Transmorphers, Snakes on a Train and the Battle of Los Angeles are all proof of their fine work 😉 😉 nudge nudge. (*cough cough*) total box office crap (*cough cough*).